A lesson at Sketchbook Skool with Cathy Johnson, klass 4 at semester 2 ‘seeing’ shows us around in nature, sketches birds and has a lot of extra resources for us to get inspired by. As one extra parting gift Cathy shows us how to make a accordion-folded journal so that I can use my favourit paper and shape for my sketchbook in an easy way. 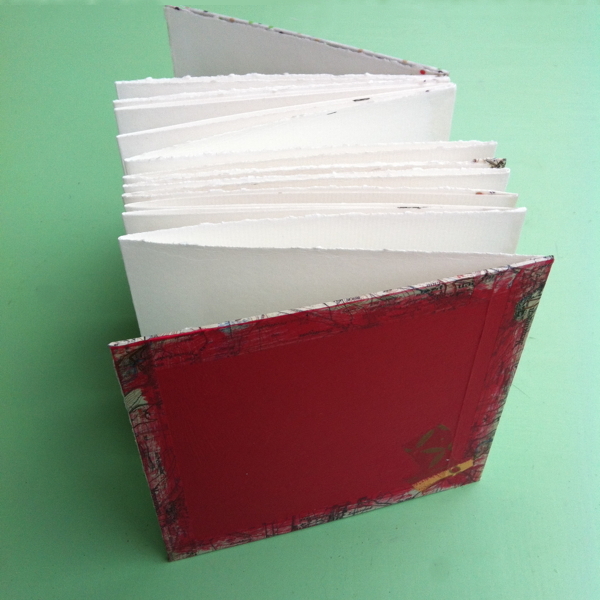 So here is my little water-color paper book in a 5,51″5,51″ square size. Ein Geschenk von Cathy ist die Anleitung für ein Buch in Akkordeon-Faltung, so dass ganz einfach ich ein Skizzenbuch mit meinem bevorzugten Papier und in meiner Wunschgröße machen kann. Das ist ein kleines Buch mit Aquaraellpapier im quadratischen Format von 14 x 14 cm.